Heavy-duty cast brass step light with hood. Same as other Brass Bunker Step Lights except it has a faceplate with hood and frosted lens. The hood prevents the light from glaring into viewers eyes as they ascend the steps. Often used in commercial applications to illuminate handicap ramps and walkways next to stone walls, retaining walls and nooks around outdoor kitchens. This step light is rated for in-grade concrete pour applications! Everything is cast brass including the back box! This step light is not only a heavyweight, but it is completely sealed and watertight. Rubber seal around lead wire exit, pressure fit rubber gaskets around openings. Frosted lens reduces glare and gives softer illumination. The Bunker is 7" wide, 3 1/2" deep, with a box height of 2 1/2 inches. The faceplate is 8 1/4 " by 3 1/4". LED G4 Bi-Pin lamps are available. Choose 4' standard or 25' 16G, SPT-2 premium tinned copper lead wire. Frosted lens for more uniform light distribution. 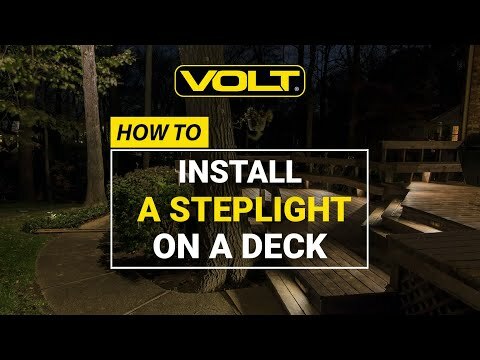 VOLT® University | How to install the Brass Bunker step light.